Tonight, an Upper West Side institution – a vaunted Upper West Side institution – tumbled shockingly from the precipice where it had tenaciously, doggedly held its grip to the sheer cliff that is restaurant business in this neighborhood. Countless places have come and gone. Some good, some bad. Some suddenly, some slowly. Tonight, the Hunan Balcony, my beloved Hunan Balcony, fell from grace. You see, Hunan Balcony has been making the exact same mediocre Chinese food for 30 or so years. The exact same stuff. It is never any better and it is never any worse. It was never particularly good, the way Shun Lee, Evergreen Cafe or other Chinese high-flyers are. But it was also never the worst rot-gut you can get at so, so many Chinese storefronts around town. You know the ones: They can leave you suffering for three days of near-hospitalization and explosive horrors hurtling from your posterior. No, the Balcony was never particularly good, but it was never particularly bad. Their genius was in hitting that sublime middle, where it was just greasy enough to make you feel guilty while also tickling your comfort food spot. It was the kind of place where you got a Lo Mein or an egg roll or pork dumplings or – and I treasure that they are still on the menu – shrimp toast. And they made cold sesame noodles. Definitional cold sesame noodles, in my opinion. Not especially good, not especially bad. But the perfect representation of the basic cold sesame noodle. 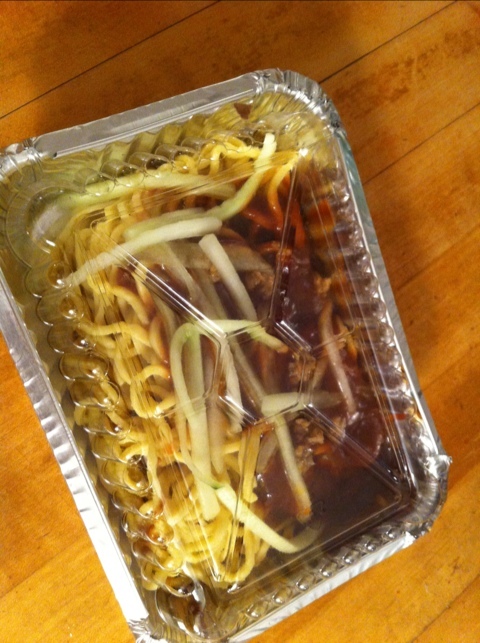 The noodles would be mixed in a tan, peanut-colored sauce. When mixed with the noodles, you could scarcely tell which noodles were sauced and which weren’t, the color of the sauce and the noodles were nearly a perfect match. Leaving aside the way it looked, there was the way it tasted. The slight kiss of heat, some delicious shredded cucumber, some scallion. It was just right. Some do it better, many did it worse, but these guys just did it in that sweet spot every time. For decades. Sluggishly lazy, I decided to indulge in some wildly bad food decisions as a little treat. So I ordered from the Balcony. Egg roll, dumplings, mu shu, and (since the order was above $10) a free side. My free side has been the same for years: cold sesame noodles. They last for days, are great right out of the fridge, I mean really, they are wonderful. I received my order, and those noodles, those precious noodles, had changed. Gone was their tan, peanut-y color. Instead, there was a mass of brown sludge atop the bed of noodles. The stuff that is the marker of crap cold sesame noodles. It’s hard to describe how crestfallen I was at the sight. At first my eyes couldn’t accept it. But there it was, like chocolate pudding atop the noodles. Brown. Sauce. I couldn’t bring myself to try it. I’m sticking it in the fridge for a few days and perhaps will attempt it. But for now, I can’t bring myself to. The Balcony’s claim to fame was their same standard food, consistently the same forever. A cornerstone has changed, and with it the spot it held in my heart forever. I just tried it. It’s yummy. I surely hope so. I can’t bear the thought that the Balcony has taken such a huge tumble. It certainly looks extremely suspicious.